When did you begin skateboarding? Back in 1976 I remember watching a documentary on TV showing a new trend in California: we could see people riding flat boards on wheels, picking up food at the grocery, then riding down the pavement. A few month later I saw my first skateboard and got it for my 10th birthday. I was born and raised in Lille, North of France, in the Flanders, close to the Belgium border and across the Channel, England. Did you play other sports as kid? Skateboard, Rollerskates, BMX (I rode a Raleigh Rampart in 1979). I started wind-surfing with my elder brothers in 1980. What type of skateboarding did you do when you began? Slalom? Freestyle? Vert? In the 70’s one had to try everything: hippie jump and barrel jumps over my friends ! I loved slalom too – I lived in a flat land. We had a steep quarter pipe to learn “3 wheels out” and “aerials”. I had two set ups at that time : a solid Logan on Mid-Tracks then Gull Wings, and a G&S Fibreflex on ACS 651. And two sets of Kryptonics : blues and reds 65. I used to change and mix them all the time. When did you first ride Kryptonics? 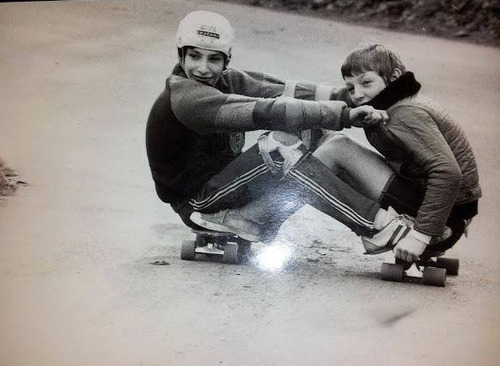 1977 - I had a stiff oak board (Logan) upgraded with Road Riders. I borrowed a board from a friend, a Sims Quicksilver set up with red Kryptonics. I felt like I was riding a magic flying carpet. I was hooked. I switched from reds and blues, then ended mixing front blues and reds back. In those days 65mm was comfortable, 70mm was considered huge. Later I turned to 70mm reds - they are still my favourite wheel nowadays. I have it stuck in my mind now: red wheels are faster! How much better were they than the competition? Above all challengers: they gave you the edge. Faster, firmer, smarter. They determined how you would skate: grippy carve for reds or slash and slide for greens (and everything in between for blues). Moreover they gave you style! So many! There was no internet then. Actually we’d wait for the next issue of the Skate Board Magazine to discover new adds, or sneak in USA imported mags shared as priceless relics! I think “We blue it” was among my favourites. What is your favorite memory from skateboarding in the 70’s and early 80’s? There was a wide lane, good tarmac, ending in a sharp L turn. When I was riding down that road I always felt like a “california dream”. Reading both fright and pleasure in your partner’s eyes while doing catamarans is always a good memory. Meeting buddies and trying to share that strange inner feeling you get when carving the perfect line. When and why did you you become so passionate for Kryptonics wheels? I had had good times on Kryptonics and felt crossed when they were underrated or looked down upon for wrong reasons. They were not the hype they were not supported by any kind of advertising and a whole generation still had to discover them! Have you always ridden them? Yes. And I still do! Actually I ride many wheels and consider Kryptonics as my milestone. Some may be more grippy bigger brighter driftier or else they stand the comparison. Their ‘buttery slide’ is incomparable. Were you in touch with the original Kryptonics company back in the 1970s and 1980s? Not during that era. One central figure at the end of the 90’s was Tom Peterson. He was an outstanding rollerskater and a visionnaire. He turned Kryptonics towards the in line market, abandoned development for the skateboarding market but helped develop new compounds with AEND and Neil Piper. Perhaps today’s best chemist for urethanes. Who are some of the the people you have known over the years from Kryptonics? So many. Each rider has his own memories and I often started the exploration simply by evoking the name Kryptonics. How long has your website Sakaroule been around? What was the inspiration for starting it? Around 2000 I started checking for wheels on the Internet and I was surprised to find few things about skateboarding. I met a famous french longboarder and blogger Pappy Boyington from Longboard in Paris and started writing to him, then blogging what I had not found elsewhere. Kryptonics raises so many fond memories and good times for several generations of skaters that I thought it was necessary to share some feedback to spread these goodies. You recently had a Kryptonics conceptual ad contest on Sakaroule, how was the response? What were some of your favorite entries? I was surprised every day when I discovered the entries. So talented, so nice, so new. I have a sweet spot for “Houston?” as it makes me smile, “We’re back” is so simple and strong, and “Back from the Dead” is in the mood of horror movies or zombies series. "Hot core" is fantastic … and I love red Kryptonics! If I had only one thing to say to any rider, it would be "get a set of Kryptonics and ride !" Getting fit to reach new goals ! You’ve been riding the new Kryptos for a couple of months now; can you share your thoughts on the wheels? Great ! You know some people consider me as a fetishist of urethane … I love the consistent shape, and the comfort of the three colours : red is like velvet, blue is silk, green is like African wax. Each duro has its specific sensation. I love the 75mm : it is a great addition to the traditional sizes. How does it feel to be the first Kryptonics Wheels Global Brand Activist? Ask Dave! As for being an activist: I feel committed to share and suggest, and blame if need be. In 1990 I moved to Guadeloupe, in the heart of the Caribbean. Imagine a group of tiny tropical islands around a volcano, green forests, waterfalls, black and white sand, surrounded by the sea. It’s been more than 20 years now, and guess what? I love it. What’s 2014 look like for you? 2013 was a transition year in many aspects. 2014 is already a great year, and we have almost 340 days left to celebrate it ! I‘d like to make friends, and get involved in new ventures in Long Distance Pumping. I will share my “coups de Coeur“ on Sakaroulé !